There are many things a women likes to hear from her husband. However, “Honey, were those lamps you gave me for Christmas expensive?” is not one of them. My husband accidentally yanked the pull chain out of the socket when he turned off a lamp in our bedroom. He tried reattaching the pull chain. After several failed attempts, he couldn’t reattach it. He thought a new lamp was in our future. But easily repaired for under $5.00. 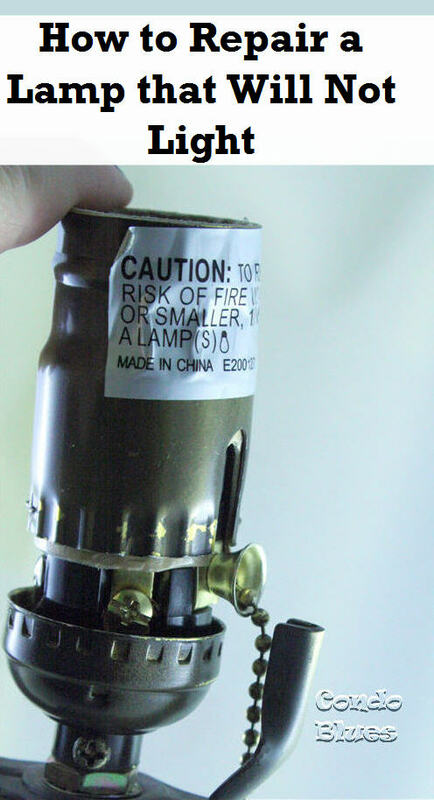 I just needed to replace the lamp socket. 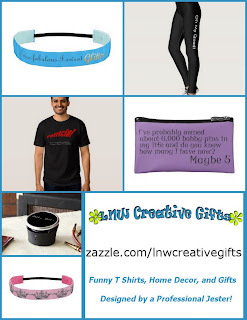 I have included affiliate links in this post for your convenience. 1. 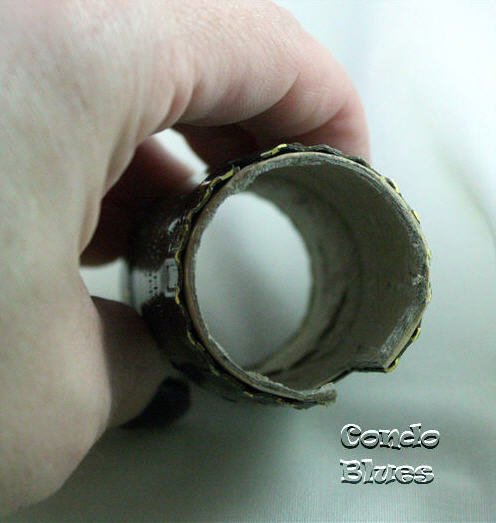 Remove the socket sleeve by pulling straight up on the socket shell. This might take a bit of oomph to remove. Ta da! You just learned how to take a part a lamp! 2. The replacement socket I purchased has a bright brass shell. 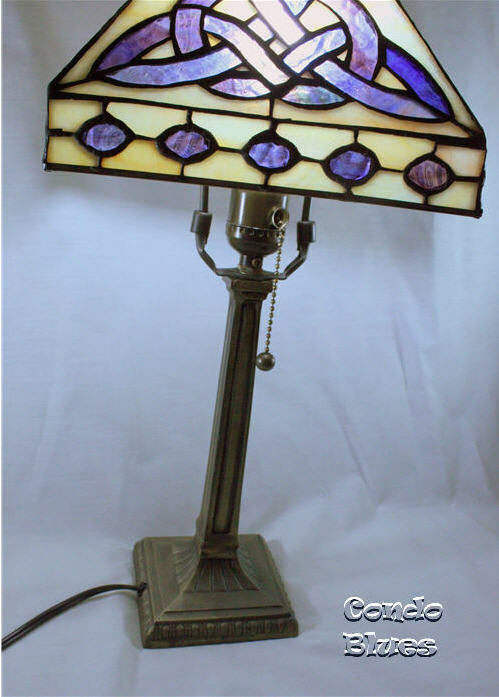 I will replace the socket guts, reuse the original lamp casing, and pull chain so this lamp matches its companion on my nightstand. 3. I removed the new pull chain from the socket. 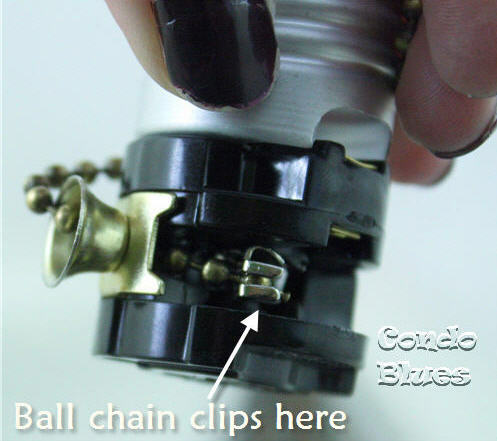 I threaded the ball chain through the front of the socket (the brass thing that looks like the bell of a trumpet.) 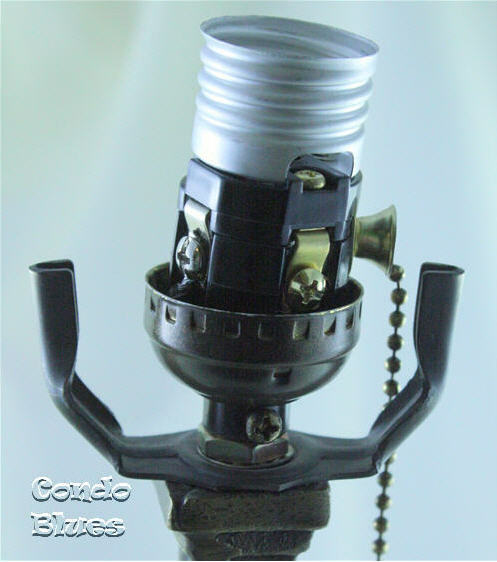 Then I used a pair of needle nose pliers to attach the end of the ball chain to the lamp switch. 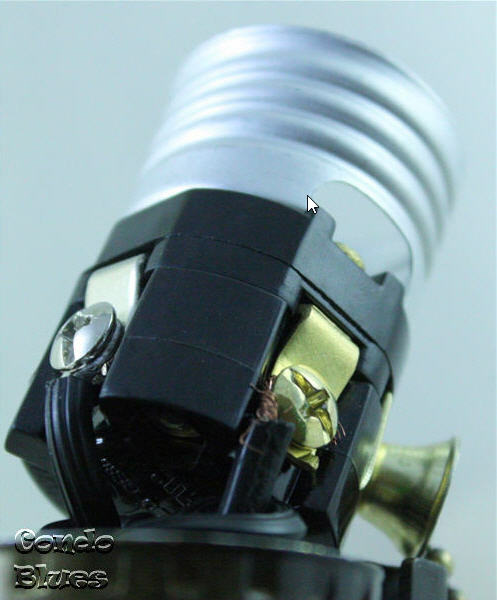 You can skip this step if you have a knob or slider switch on your lamp socket. 4. Do you see how I left the electrical cord tied in a knot when I removed the old lamp socket? That knot is not a mistake. It is an Underwriter’s Knot. 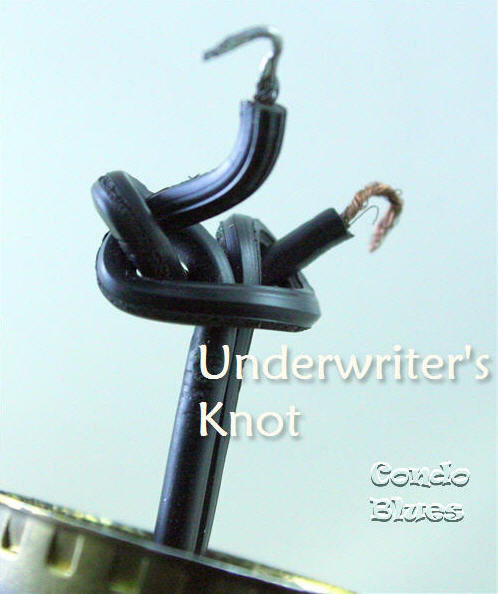 The Underwriter’s Knot keeps the wire from pulling loose at the terminals if someone yanks the cord from the wall. Obviously only a person who is disrespectful of your socket replacement skills would do such a thing but it is a best practice for a reason and one I suggest you follow. I left the original Underwriter’s Knot intact so I would not have to untie it. If you need to tie an Underwriter’s Knot check out this diagram. Not only is the Underwriter's Knot useful, it is often required code. Please check your local building codes to make sure. 5. Use the needle nosed pliers to twist each set of the wire strands together so you can wrap the wire all the way around the connecting screws in Step 6. This is how much wire casing was stripped from the lamp cord when took it apart to repair the socket. 6. Loosen each terminal screw on the socket with the screwdriver. 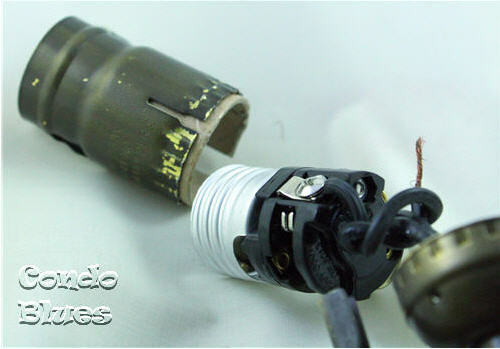 Use your fingers or the needle nosed pliers to wrap each wire counterclockwise around the base of the screw. Attach the ribbed (or otherwise “indicated”) wire to the silver screw. 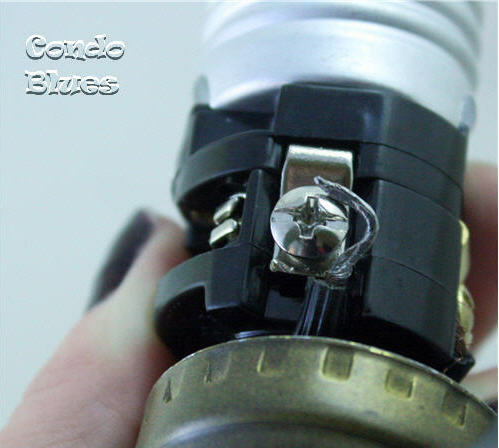 Attach the smooth “hot” wire to the gold screw, and tighten each the screws into place with a screwdriver. I didn’t strip more insulation from the ends of the wires and I should have to make sure there is enough appropriate wire connecting to its appropriate crew to complete the electrical circuit and light the lamp. 7. Place the socket into the socket cap. 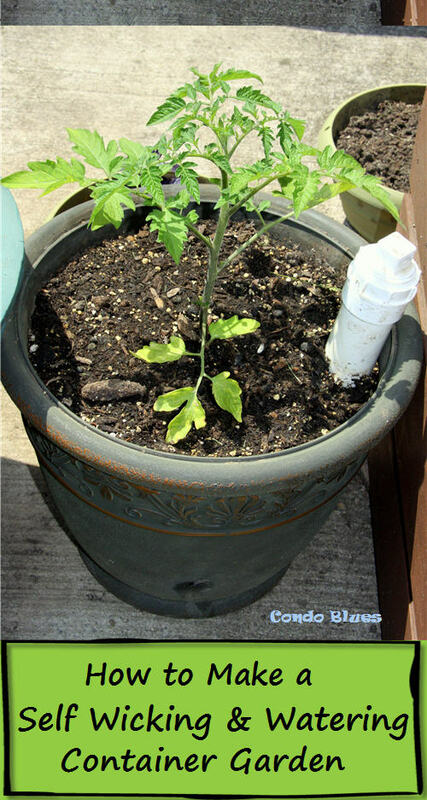 You may have to gently pull on the lamp cord from the bottom of the lamp to get a close fit. Good thing you tied that Underwriter’s Knot! And why it is a good idea to wrap the wire counter clockwise around each terminal screw. 8. 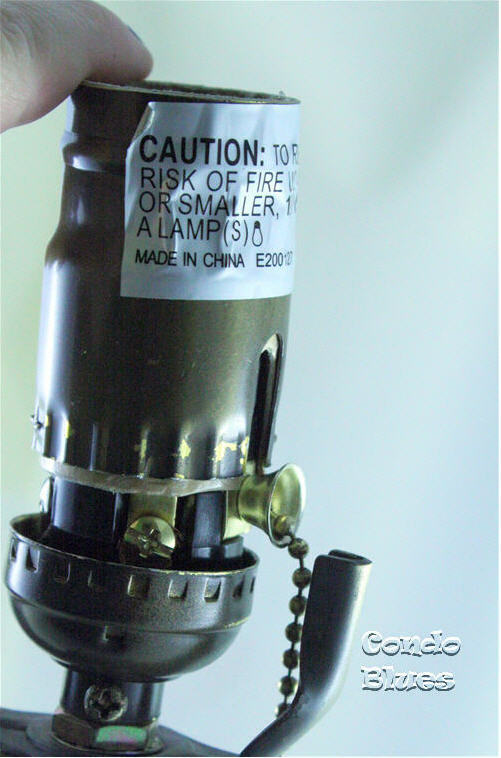 Leave the cardboard insulating sleeve inside the top lamp socket shell. 9. Slip the socket shell over the socket and into the socket cap. 10. Screw in a light bulb, plug in the lamp, and light up the night! I wrote the original version of this post for the blog Pretty Handy Girl and am republishing it here with edits and updates.